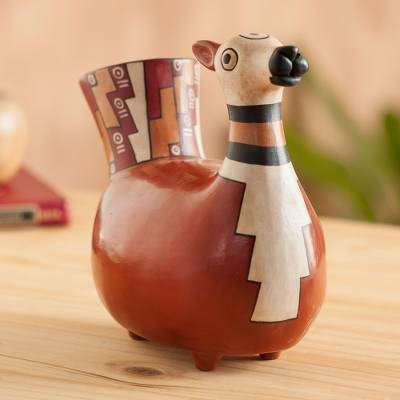 Handcrafted Ceramic Inca Replica Sculpture, "Little Llama"
This charming ceramic vessel by Walter Jose Acosta depicts a little llama. Crafted and decorated by hand, the sculpture replicates the art of Peru's ancient Moche civilization. Domesticated animals such as the dog, guinea pig and llama often figured in their highly developed ceramic arts. You can find ceramic sculpture 'Little Llama' by Walter Jose Acosta in sculpture categories such as Animal Themed Sculpture, Archaeological Sculpture, Nat Geo Decor Sculpture and Ceramic Sculpture. Enjoy exploring these sections for other Novica treasures. Walter Jose Acosta has received 6 microcredit loans with 0% interest from Kiva and Novica, the first for $400 and the most recent for $600. Proceeds were used to invest in the purchase of a new kiln as well as in clay, pigments and paintbrushes. The little llama is absolutely beautiful. Thank you so much. "Love love love this Llama"
After visiting Peru, was saddened that we didnt bring home more art for home, for we fell in love with the people, food and history. Novica and this amazing artist have provided us with a lovely treasure for our home. We bought 4 pieces, and this llama is a joy to see each day. High craftmanship, skill, and attention to detail are qualities of each piece. Highly recommend this artist's work. I would be happy to have any of this artists pieces in my home. This is a beautiful depiction of the llama. The craftsmanship is lovely. The recipient of this gift absolutely loves it and has already named it! "Wonderful addition to our collections"
This is a beautiful and very nicely crafted sculpture for home display. It is quite obvious this artisan has highly refined skills through years of experience, and takes great pride in sharing his heritage and handiwork. I enjoy looking at it every day in my study, alongside a companion piece. I have bought as an anniversary gift two beautiful vases from this greatly gifted artist and they were a great success. My husband loves precolombine ceramics and he was delighted to see the quality and beauty of the pieces. For sure I will buy pieces again from this artisan, so happy I bought them! I received ""Childbirth,"" and the artistry was truly stunning! The detail is exquisite on such a small sculpture. I always prefer sculptures which reveal a lot to touch, and this is one of those. It is rich with emotion.